Do you remember all the delicious treats your mom made for you when you were a little child? Birthday cakes shaped like dolls and your favourite cartoon characters, Pizzas with faces made with tomato sauce. Don’t you still wish sometimes that you were a little child and eat those fun delicious cakes and cookies? 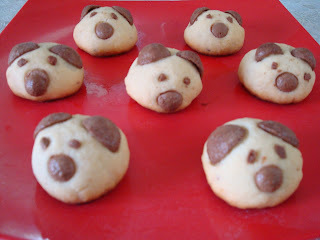 Try these cookies, simple and delicious Very Happy Puppy Cookies. I made them at home last week and they made everyone happy. They turned my father and sister into a greedy child. They were both fighting for the last piece and guess who got it? Someone named foodie and a someone named tryingstein. So try them and see how they make everyone happy. This recipe will make 12 Very Happy Puppies. Preheat the Oven at 160 degree Celsius. First measure all the ingredients. Cut the dark chocolate in small pieces. Sieve together the all purpose flour and powdered sugar and keep it aside. Then take softened butter in a bowl, add in the all purpose flour(maida) and powdered sugar mixture to the softened butter. Rub the butter into the flour and make cookie dough. If required, add a sprinkle to cold water to bring the dough together. Do not knead this dough. Now divide it into twelve equal portions. Make the rounds with dough and press in pieces of dark chocolate in the centre of the round and seal it up while rounding. Grease a baking tray or line it with butter paper. Set the chocolate stuffed cookie rounds on a greased tray. Use the Choco Flakes as ears on both the sides of the cookie rounds. Make a nose with chocolate button placed right in the middle of the round puppy face. Now, break little pieces of Choco flakes to make the little eyes of the Very Happy Puppy. Tip: If you don’t have chocolate buttons you can also use the chocolate cereal to form a triangular nose for the very happy puppy. Now place the greased cookie tray in the pre-heated oven and bake the cookies for 20 minutes at 160 degree Celsius. Do check them once after fifteen minutes, just to see if they are already done. They will lose the ‘wet’ look if they are done. They look a slight golden shade of off-white.